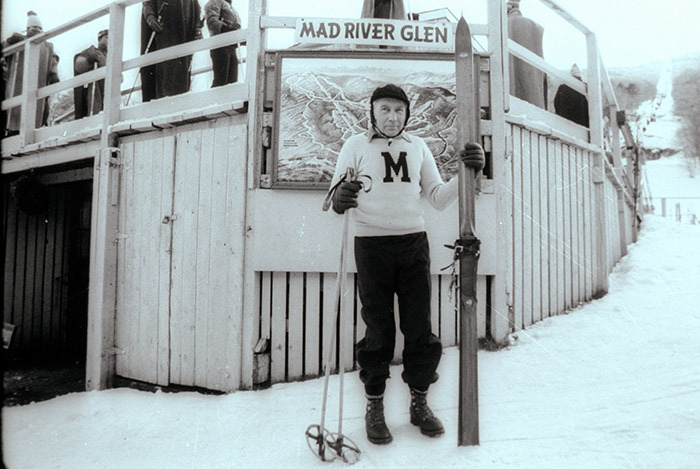 Mad River Glen first cranked up its now famous Single Chair on Dec. 11, 1948. Roland Palmedo, the mountain’s founder, had built the Single Chair at Stowe in the 1930s. Early on in Stowe’s skiing history, he became disenchanted with vying commercial interests there and became committed to developing a new ski area where sport, not profit, would be the objective. Palmedo, a Navy pilot that served in both World Wars I and II, took to his plane and scoured the Green Mountains for the perfect location to start his new venture. 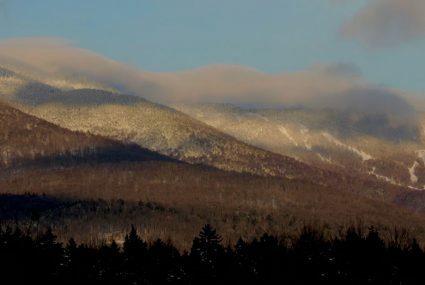 After carefully considering various options that included Killington Peak, Mount Abraham and Mount Ellen, he settled on the relatively diminutive General Stark Mountain. He selected it because of the trail and terrain potential, its northern exposure, the abundance of snow, and that it resided entirely on private land. He purchased over 700 acres from the Ward Lumber Company and began work toward fulfilling his dream. He engaged the American Steel & Wire Company to build a state-of-the-art Single Chair which, at the time, was the fastest in the world. The mountain opened for the 1949 season with a network of five trails. Mad River Glen was considered a “top shelf” ski area that went toe-to-toe competing with New England’s best known early ski operations. Over the ensuing decades the new Sunnyside Double Chair was added in 1961 along with its gentle terrain, followed by the Birdland novice area in 1967, and the Practice Slope Chair in 1971. As the ski industry changed with the advent of snowmaking and increased grooming, Mad River Glen remained relatively untouched by time. This was due mostly to the fact that there was precious little water for snowmaking and the steep, raw terrain did not lend itself towards more grooming. In 1972, a group led by Truxton Pratt purchased Mad River Glen with his wife, Betsy, taking controlling interest of the Mad River Corporation upon his death in 1975. Over time and in many ways, Mad River became a skiing backwater, year after year became increasingly unique in the ski industry. Betsy Pratt worked hard to maintain Palmedo’s vision and stewarded Mad River Glen by protecting it from the many changes in the ski industry. When Pratt decided to sell the ski area, she wanted to sell it to the only people she felt she could trust: Mad River Glen’s loyal skiers. After several failed attempts she stumbled upon the idea of creating a cooperative ownership structure to achieve her goal. This project represents the embodiment of the Mad River Glen spirit. When faced with the question of what to do with it aging Single Chair more than 80 percent of the co-op shareholders opted to spend a premium to restore the iconic lift and retain the existing uphill capacity rather than build a more modern and less expensive double chair (or, heaven forbid, a quad!). Not only did the co-op make this bold decision but they also embarked on a never-before conceived campaign to raise money for the project. Partnering with the Stark Mountain Foundation and the Preservation Trust of Vermont the Mad River Glen community raised the entire $1.8 million price tag for the project through donations. While the co-op has certainly been a tremendous success there are environmental and economic challenges that will always require thoughtful consideration. The Mad River Glen Cooperative is an amazing and unique organization that will find a way, the “Mad River Way,” to ensure its future. Today, Mad River Glen is the only ski area in the nation on the National Register of Historic Places. 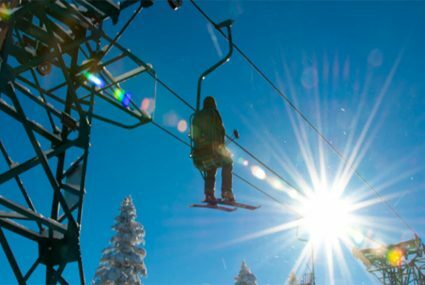 It has more than 1,800 individual skier-owners who have purchased more than 2,200 shares. Unlike other ski areas, Mad River’s goal is to maintain and preserve the experience rather than to overhaul or upgrade it. Both the skier-owners and the management understand that skiers come to Mad River for the unique combination of legendary terrain, sense of community, low skier density, and intimate atmosphere. Ski it if you can! The best place to learn more about Mad River’s past is by checking out our amazing coffee table-style history book “A Mountain Love Affair – The Mad River Glen Story” – Available at the Mad River Glen General Store. Author, Mary Kerr not only chronicles the history of one of the most beloved and hallowed ski areas in America, she also captures its true essence. Using extensive interviews, primary source materials, and 25 years of first-hand knowledge she weaves an incredibly compelling tale. This full color, hard cover is available at the General Store. You can also watch Spirit of a Classic – The Story of Mad River Glen. 1947-48: Initial trails cut: Catamount, Lift Line, Fall Line, Canyon and Porcupine. November snows stop construction and the opening is postponed for a year. 1948-49: Trails improved, work tram, lift and Stark’s Nest built. Opening ceremonies were held on December 11, 1948. 1952-53: Jack Murphy becomes General Manager, Ken Quackenbush starts his career at MRG. Chalet 10 (little house across from Amateur Ski Club house) is built. 1954-55: Practice Hill Rope Tow is installed. MRG hosts the NCAA Downhill Championship Race. 68 new chairs are added to the 65 all ready on the Single Chair’s line more than doubling the lifts capacity. 1955-56: The Base Box’s first addition (the east end) is built. 1957-58: McCullough Turnpike (current Route 17), the road over the mountain is finally completed. 1958-59: New tower is added at the bottom of the Single Chair. Beaver trail is cut. T Bar goes in on the Practice Slope. Sugarbush Valley ski area opens. 1959-60: First Ski Shop is built over the brook. 1960-61: First Tucker Snow Cat is purchased. The second Base Box addition (currently Gen. Stark’s Pub) is completed. Trails were cut for proposed Sunnyside double chair. 1961-62: Sunnyside Double Chair opens. First Green & Gold Weekend. The infamous Parachute Race into Catamount Bowl. 1962-63: A new trail, Quacky, is added and named for Ken Quackenbush. 1963-64: Lower Antelope opens. Another 25 chairs are added to the Single Chair making it a total of 158 chairs on the line. 1966-67: Birdland Trails open. Rudi Maier Ski School opens. Touring trails open. 1968-69: Birdcage Opens. Last season food and beverage are served at Stark’s Nest. Saturday night movies! 1969-70: National Slalom held at MRG. Four tracked vehicles used on mountain. 1970-71: Junior Nationals held at MRG. Vermont’s Act 250 development law is passed ending land sales on the mountain. Tennis courts built at Mad River Barn. 1971-72: T Bar dismantled and replaced by new Double Chair Lift. Mad River Junior Racing Program starts. 1982-83: Sunnyside Double Chair drive replaced. 1984: “Ski It If You Can” Bumper Sticker introduced – Check out the whole story! 1986-87: Snowboards first allowed at MRG. 1991-92: Snowboard ban begins at MRG. 1995-96: Mad River Glen Cooperative purchases mountain an December 5, 1995 and the mountain opens with ceremony at the Single Chair on December 7. 1997-98: The Ice Storm of 1998 hits Mad River Glen, causing a great deal of damage to the mid-mountain forest. Clean-up crews and volunteers have the mountain re-opened within a week. 1998-99: Mad River Glen celebrates 50th Anniversary with a re-creation of the original opening day. Just like the original opening the Governor, Miss Vermont (both 1948 and 1998) and George Neill were in attendance. 50th Anniversary Gala held in January 1996. Sunnyside Double Chair is replaced. Here is a video of the 50th Anniversary. 1990-2000: The Co-op sells the 1,667th share to pay off its mortgage. The mountain is now owned outright by the Co-op. 2000-01: Callie’s Corner Handle Tow Area is added and Stark’s Nest is renovated. Over 325 inches of snow allows skiing to continue until April 29, 2001, the area’s latest closing date on record. 2005-06: The Mad River Glen Cooperative celebrates 10 years of skier ownership of the mountain. 2006-07: On Easter Sunday, April 8, the original Single Chair brought its last skiers to the top of Gen. Stark Mountain. The last rider was long-time Mad River Glen GM, Ken Quackenbush. Fittingly the Single Chair was ushered out of service in a snowstorm that ended the season in a fabulous powder day. 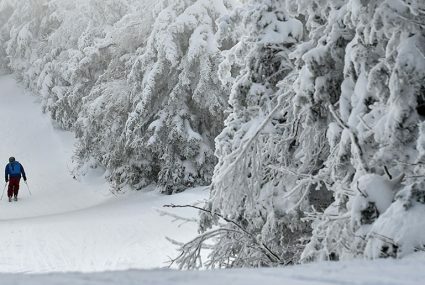 New England Lost Ski Area’s Project – So Cool! Priceless skiing history of ski areas that are no longer with us. International Skiing History Association – a U.S.-based organization working to preserve and build awareness of the sport’s heritage. Publishers of Skiing History Magazine. Sugarbush Resort History – A brief outline of the History of Sugarbush, our little sister to the south. There have been many wacky spring events over the years but never in MRG’s fabled history has there ever been a “Pond Skim” at the base of General Stark Mountain. That’s all going to change on Saturday, April 13th at 11 am when we host the Mad River Rage Pond Skimming Extravaganza. We didn’t want…. The Preserve Our Paradise public campaign ends April 30! Every donation, at any level, will be matched dollar-for-dollar, up to a total of $200,000, through April 30. Time is running out! With your help, we can fund our largest projects, including essential renovations to the Basebox and the Patrol Building. All donations of $250 or…. 2020 Passes On Sale Now! For the first time in MRG’s history we are selling season passes in the spring. Why buy now? BUY YOUR 2020 SEASON PASS NOW! Ski the rest of the Spring and next season tooDo it now and ski the rest of this season and next year too. Especially good for skiers who are thinking about….